Thank you for considering Holy Spirit College for your student’s education. 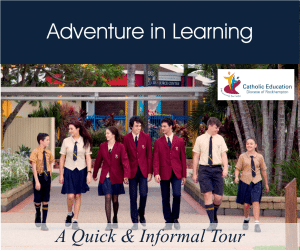 Click the picture below for Adventure in Learning! At Holy Spirit College, Students enjoy the benefits of a complete secondary schooling environment – from Year 7 through to Year 12 – a structure which offers continuity, a plethora of opportunities and broad curriculum offerings. But more than those advantages, Students also enjoy the benefits of specialised programs for each individual phase of their secondary schooling – whether it be HSC’s unique ‘Studentship Program’ across Years 7 to 12, or our ground-breaking ‘Transition into Senior Program’ or our experience-based Junior program. Each Student has the opportunity to discover where and how his or her skills and abilities are best developed. Our motto, Peace and Unity, is indeed a true reflection of our mission at Holy Spirit College! It is often the ‘feel’ of a school which can give the greatest insight into its ethos and we encourage you to visit us on campus and experience our dynamic community firsthand. We welcome your interest and warmly invite you to make further contact to discuss the possibilities for your Student(s) and so that you can truly understand why Parents, Students and Staff recognise that, at Holy Spirit College, we act In One Spirit to Launch our Adolescent Students into Lifelong Learning! Dip. Teaching, Grad. Dip. Ed. Adminl, Grad. Dip. Arts (Religious Education), Grad. Dip. Ed. (Exceptional Students), M. Ed., PhD.